How recent is "recent"? The small martian gullies discovered in Mars Global Surveyor (MGS) Mars Orbiter Camera (MOC) pictures of certain craters, troughs, and valleys between latitudes 30° and 70° appear to be geologically young. This means that, on the scale of a planet that is 4.5 billion years old, the gullies may be only a few million, or less, years old. The youth of these gullies relative to the history of Mars is indicated by the lack of impact craters--formed by meteors--on the alcoves, channels, or aprons of these features. However, other evidence suggests that the gullies may, in many cases, be much younger than a few million years--in fact, some might be actively seeping water in modern times. The first picture, "Apron Covering Dunes," shows a deep, prominent martian gully in a south-facing wall in Nirgal Vallis near 29.4°S, 39.1°W. Sunlight illuminates the scene from the upper left. At the bottom of the picture is a series of evenly-spaced, almost parallel ridges. These ridges are dunes created by windblown sand. The apron--the fanlike deposit at the lower end of the deep channel--at this location is seen covering some of the dunes. The sand dunes are thus older than the apron of debris that came from the channel. The dune field has no small meteor impact craters on it, so it, like the gully landforms, is geologically young--yet older than the apron. If the dunes are active in the modern environment--which is uncertain despite the apparent youth of the dunes--then the apron would have had to form within the past few centuries or less. This picture was taken in September 1999. The second picture, "Apron on Polygons," shows aprons deposited at the base of the south-facing slope in an impact crater at 54.8°S, 342.5°W, in Noachis Terra. The slope and plains surrounding the apron materials have a bumpy pattern of evenly-spaced polygons. Polygonal patterns like this are common in the middle and high latitude regions of Mars, and, like their counterparts in the Arctic and Antarctic regions of Earth, probably form by stresses induced by seasonal and daily freezing and warming cycles of ice in the ground. Such polygons, where found on Earth, are usually only several to tens of thousands of years old, at most. The fact than an apron of debris covers such polygons, and no new polygons have formed on top of the apron, all suggest that the apron--and therefore the gully involved in slope erosion at this location--may be no more than a few tens of thousands of years old, and could be much, much younger. 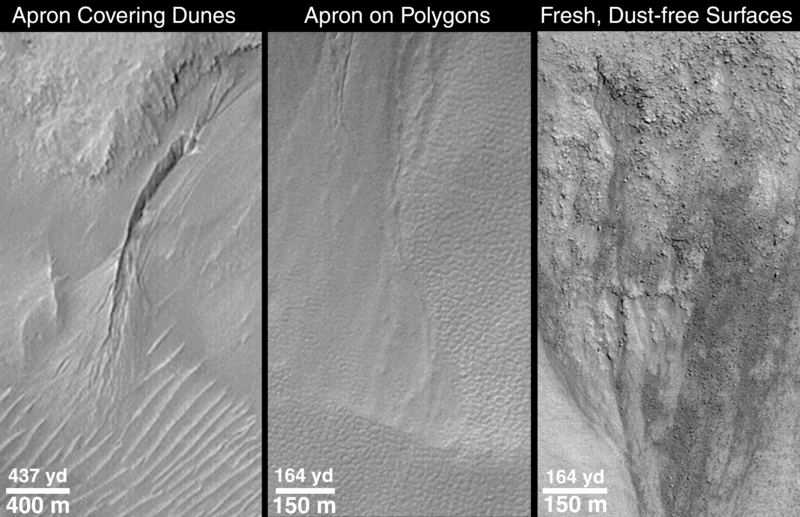 The aprons shown here are from the same July 1999 picture as shown in an accompanying release, "Basic Features of Martian Gullies;" the picture is illuminated from the upper left. The third picture, "Fresh, Dust-free Surfaces," shows a January 2000 view of small, dark channels eroded into one of the gully alcoves found in the "Aerobraking Crater" located at 65°S, 15°W. Two aspects of this picture indicate that two of the processes that contribute to martian gully formation--liquid water seepage and downslope movement of dry, as well as wet, debris--have probably occurred in the near-recent past. In this case, near-recent could mean "within a few days of when the picture was taken" to "within a few years of when the picture was taken." One aspect is the sharp contrast between dark-toned and light-toned surfaces. On Mars, fine, bright dust can settle out of the atmosphere and eventually coat surfaces so that the contrast between dark and light terrains is hidden from view. There was an experiment on the Sojourner Rover in 1997, for example, that found dust to be settling out of the atmosphere almost all of the time during Mars Pathfinder's 83-day mission. If dust were settling on the alcoves and small channels shown here, they would not appear to be so dark relative to the surrounding, bright, dust-covered terrain. The other attribute of the picture that suggests relative youth is the preponderance of boulders and their sharp, crisp relief which indicates that they have not yet broken into finer debris, nor have they been covered up and mantled by sand or dust. Sunlight illuminates the scene from the upper right.